XLabz is proud to announce that our highly anticipated social gaming mobile application GeoSocials is finally here and is available for the iPhone! 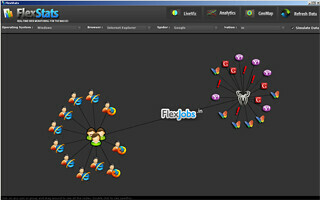 The Android version, which is developed from ground-up in Adobe AIR, is scheduled to be released in a few weeks from now. Now, for a quick glimpse into the world of GeoSocials. GeoSocials is a hyper-local, hyper-social networking game which revolves around YOU! It is a whole new way of exploring the world around YOU and getting rewarded in the process. 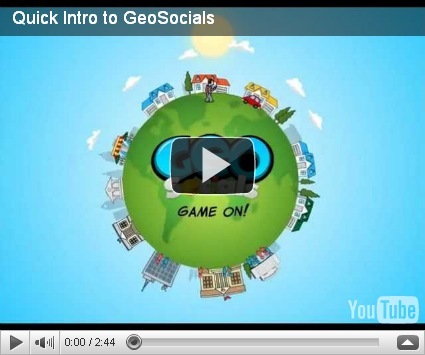 GeoSocials is a perfect blend of location, socialization, gamification and rewards. The game’s premise (and tagline) is simple – Play, Win and Socialize. You get to do all this through the different gameplay modes: The Treasure Hunt Mode, The Social Mode and The Rewards and Discounts Mode. Once installed, GeoSocials uses your smartphone’s GPS sensor to sense your location on a map and activates the game. While on the Treasure Hunt mode, you need to start looking around for treasures that other players would have dropped around your vicinity. In order to claim these treasures, you would have to solve simple challenges. Solving these challenges is probably one of the most fun activities you get to do on GeoSocials, cause in the process you might just find yourself flicking your fingers vigorously on your phone, shaking it or even blowing into it! As you notch up some serious net worth, your score goes up on the GeoSocials Leaderboard, which shows not just where you stand locally but also globally! Players from your neighbourhood and across the world will know who you are, admire your awesomeness and even try and compete with you! To keep gaming on, you can go ahead and drop treasures at your favorite hangout or just about anywhere you please, for the other players to pick up. So now your pals can have an awesome time unlocking those treasures and you get even more points for dropping them! Now, coming to the very core of GeoSocials- the Social Mode! Now here’s where you can check out all the interesting folks around you and invite them to be your GeoBuddies. Once you become GeoBuddies with someone, you can strike up a conversation and who knows? You might find a friend for life! The more, the merrier and that is why GeoSocials is most fun when you play it with a whole bunch of friends. This is what makes your treasure hunt far more exciting cause now you can pit your wits against your friends and other gamers and make your mark on the leaderboard! Next up is the “Rewards and Discounts” mode. Here is where some of the best brands in your city might have dropped some cool discounts, deals and rewards which are up for grabs. Think a free meal or an awesome discount on that pair of jeans you’ve been eyeing! Cool right? So yes, this is what GeoSocials is all about. You can read up more about us www.geosocials.com. GeoSocials is now officially live in countries around the world except for a few and is currently available for the iPhone, iPad and the iPod Touch. You can download it for free on the iTunes App Store and also from our site. We don’t want to disappoint our Android fans and so are now working on the Android version of GeoSocials! We’ll be available soon to those of you who have Android phones which support Adobe AIR. So stay tuned! Unlock your neighborhood, have FUN and blaze a trail with GeoSocials! No User Responded in " GeoSocials is LIVE! – GPS based social gaming app for iPhone (and soon for Android) "
« “Find Near Me” for BlackBerry PlayBook is here !! !